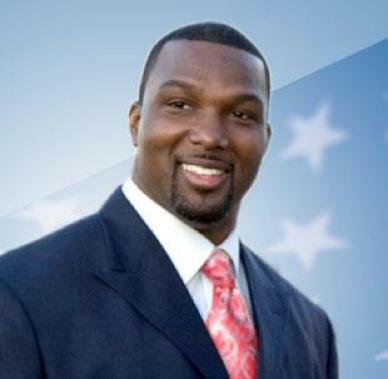 State senator and former Northwestern football player Napoleon Harris announced on Wednesday that he would be dropping his candidacy for the 2nd Congressional District seat formerly held by Rep. Jesse Jackson Jr.
After talking to his wife Tuesday, Congressional candidate Napoleon Harris said he went to sleep confident he had the race in the bag. The Northwestern alumnus (Communication ‘02) was running for the seat vacated by then-U.S. Rep. Jesse Jackson Jr. (D-Ill.), who resigned in November. But on Wednesday, Harris announced he was dropping out of the race for the 2nd Congressional district seat and backed another candidate, former state Rep. Robin Kelly. Harris, a former professional football player who played in Super Bowl XXXVII with the Oakland Raiders, recounted the past week’s events as a blur of campaigning interspersed with sleep. Harris said he dropped out to round up support for Kelly, whom he believes best represents the district’s constituents. Harris announced he would run for Congress shortly after winning the 15th district state senate seat. The Dixmoor, Ill., native had never held public office before taking the state senate seat. He was running for Congress along with 16 other Democratic candidates, including former congressmen and state senators. Harris said Kelly shares many of his views, among which are advocacy for gun control and support for small businesses. Kelly, who has worked at the county and the state levels, has received endorsements from three other state senators, though her former employer, Cook County Board President Toni Preckwinkle, endorsed state Sen. Toi Hutchinson (D-Chicago Heights). Kelly thanked Harris for his endorsement in a campaign statement Wednesday. “I am honored to have his endorsement and look forward to a long partnership together, working to stop gun violence and get dangerous weapons off our streets,” she said. Hutchinson’s campaign manager, Vlad Gutman, took a snipe at Kelly’s campaign after she received Harris’ endorsement. “She accepted the endorsement of Sen. Napoleon Harris, one of the Democratic Party’s most deeply conservative voices,” Gutman said in a statement. State Sen. Kwame Raoul (D-Chicago) said he was “pleased” with Harris’ decision to drop out, stressing the importance of concentrating support behind a few candidates to represent the district’s black community as the Feb. 26 Democratic Primary approaches. “This special election is unintentionally causing the dilution of the African American vote, which the Voting Rights Act is all about,” Raoul said, referring to the redrawing of the 2nd Congressional district’s boundaries to give a voice to minorities. Harris said supporters have complained about his decision, but he will focus on fulfilling his responsibility as a state senator and work on issues such as education reform and gun control.